Choosing an electric wall mounted fireplace can help free up space in your room by attaching to the wall. Covered by glass and often including safety features, this heating option helps to reduce fire hazards, while providing an immediate source of heat without the hassle of a fire. That said, the LED technology in electric fireplaces, combined with variable light settings, create a very realistic wintery ambiance for snuggling up with your family. Want to know about wall mounted fireplace options? Check out this guide to understand what to look for and where to start to make the right decision for your home. Clearance around electric fireplaces is integral to preserve safety. If there isn’t enough clearance around the fireplace, due to the clutter of furniture, or other objects, it creates a fire hazard. As the fireplace heats up, it can cause detrimental effects to objects placed too closely. When installing a wall mounted fireplace, you need to consider the space you have in order to effectively choose a design that fits with enough clear space around it. 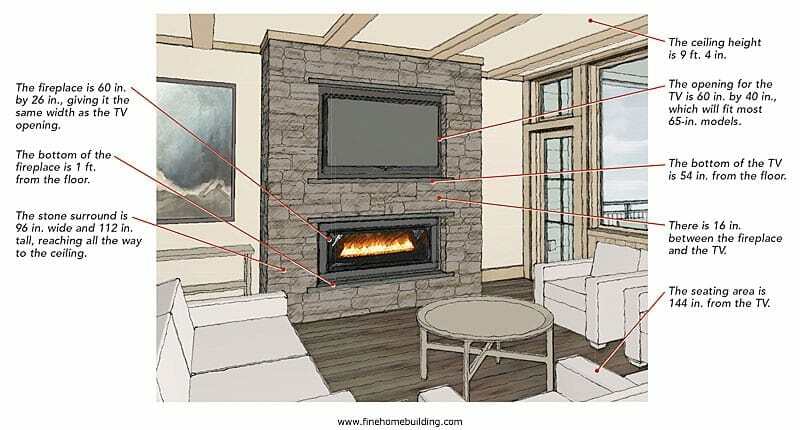 There should be three to six feet of clearance space around the wall mounted fireplace. This includes anything that hangs on the wall, the floor, and suspended from the ceiling. If your fireplace has a mantel, think carefully about what you place on top of it. Flammable objects may cause an issue. You need to consider the room in which the electric fireplace will be situated and how it will look. The wall you choose should have three to six feet of clearance from all sides, while also being able to hold the weight of the fireplace. Generally, it shouldn’t be much larger than a TV. Measure your wall space first. While energy efficient wall mounted heaters tend to be expensive up front, they will save you money on the running costs. They are more effective at heating the size of the room they’re designed for, and energy efficient models also cut costs by using less power. Look for the Energy Star seal to show the more eco-friendly and efficient models. While the physical size of the wall fireplace makes a difference, the power behind it is even more important. The size of the room will determine the power capacity you need. In general, you’re looking at ten watts of power per square foot. Measure the room to calculate the wattage you need to heat the room effectively. If the heater is too big, it will waste energy, whereas one that’s too small won’t heat effectively. There are two main styles of wall mounted fireplaces: flush and recessed. While both need to be installed using brackets, the flush model goes flat against the supporting wall. The recessed version slots into a cut out in the wall. These are a little harder to install. Delivery vents are either situated at the top or bottom of the fireplace to deliver heat. Think about how your room is organized. Those with a lot of furniture down low may find that the objects block the heat emitted from a bottom vent. If you have a T.V. mounted above, you may not want to install a top vented heater. 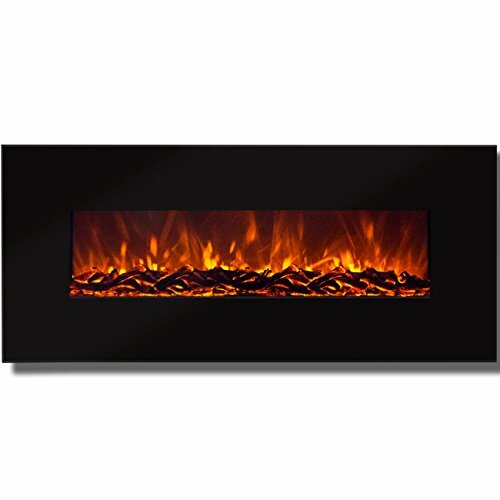 If you’re looking for a high-quality wall mounted fireplace, check out these reviews. We have provided a guide to some of the best models on the market to give you an idea of what you’re looking for. 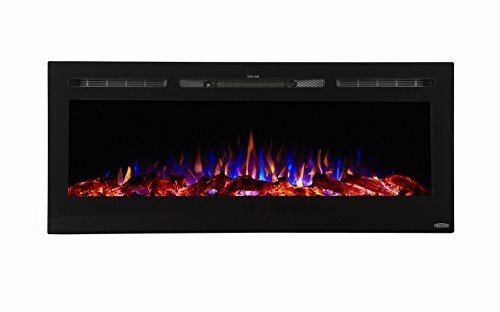 With two heat options, this easily installed, wall hanging, electric fireplace comes with a realistic log set. The LED technology saves on energy, while it measures in at 50.4 inches by 21.65 inches. This easy to install heater can heat significantly sized rooms relatively quickly. Although the fan is a little loud, the LED lighting gives the logs five different mood settings, creating a relaxed atmosphere. This recessed, wall mounted fireplace can heat up to 400 feet of space and comes with two heat settings. It has a stylish look and three color changing options for the flames. The 50-inch fireplace combines fake logs and crystal glass for a homey feel. More suitable for smaller spaces, this recessed model saves space while heating quickly. The color changing effects give it a more playful feel, while the variable heat settings enable a more comfortable, consistent temperature. This recessed electric fireplace can be plugged in or hardwired. The ultra high intensity LED lighting has four different flame effects for varied ambiance and color. It has a thermostat and can heat up to 400 square feet. This needs to be installed very securely as the glass is quite fragile. However, once installed, the varying heat and light settings set a great atmosphere in the room, while the remote makes for easier operation. Featuring two power outputs, 750 watts, and 1500 watts, this heater measures 35 inches by 22 inches. It has thick tempered glass and a stylish finish. Mounted flush to the wall, this model comes with a remote control. While durable, this model is a little noisy. 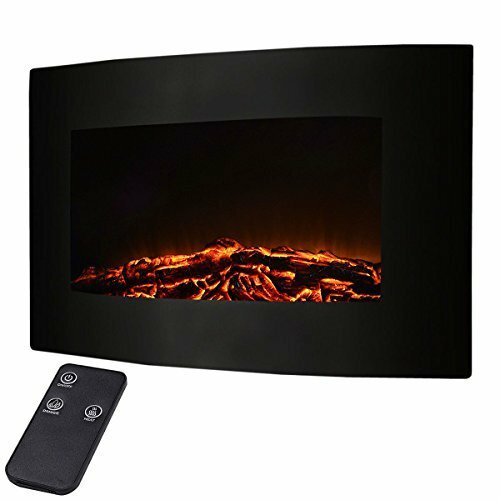 It is convenient to operate and has multiple heat settings, although it is a little smaller than other wall mount fireplaces at only 35 inches. 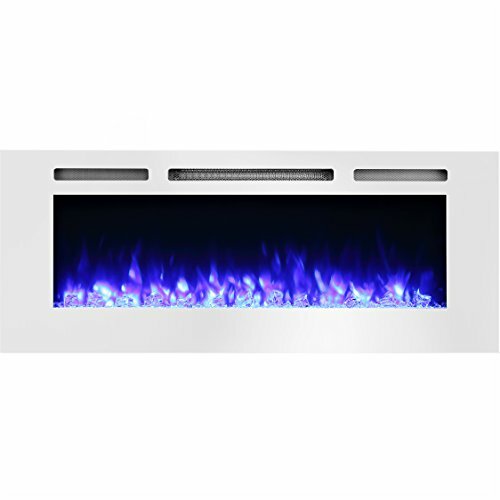 With three modes, including fire only with no heat, this 50-inch model has a slick, contemporary finish. The timer can be set for 30 minutes up to 7.5 hours and can be controlled by remote. With a sleek, modern look, this heater sits flush against the wall. The timer and remote allow for easy operation, while variable settings enable better temperature control. The flames are a little ‘square’ but the energy efficiency makes this model well worth it. 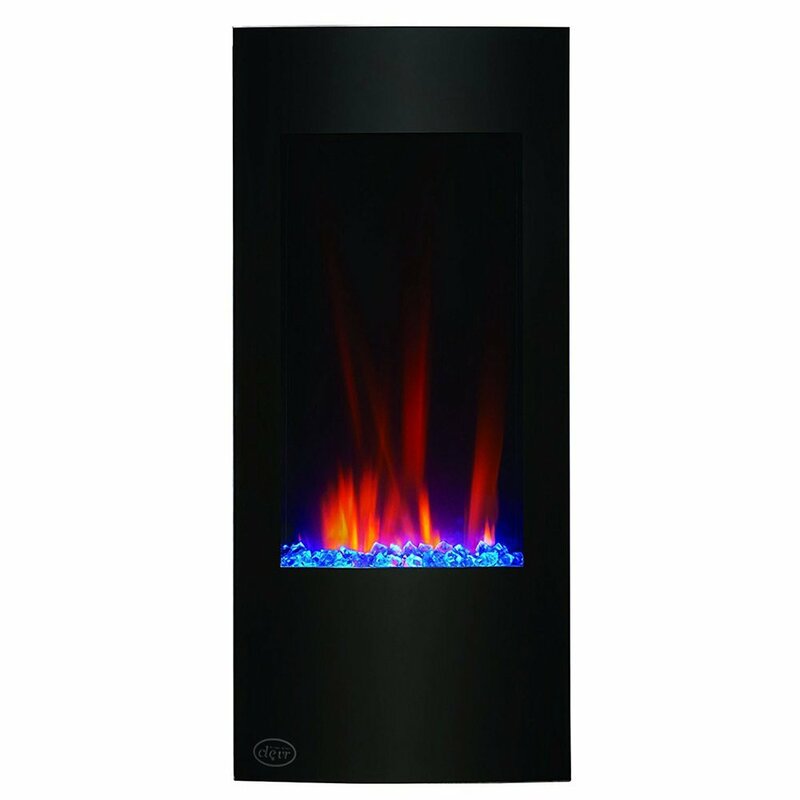 With a breathtaking vertical design, this flush model has two heat settings and adjustable backlighting. With both tip-over and overheat protection, this model is very safe. The heating vents release heat from the top, while this heats up to 400 square feet of space. Gets Too Hot to Touch/Unsafe for pets and children. With a stunning aesthetic, this vertical wall mounted fireplace has six different lighting options for a versatile look. It does get hot to the touch so you use caution with this unit. Easier than one would expect, installing a wall mounted fireplace isn’t difficult. In all honesty, a recessed model is more of a challenge to install; especially if you don’t already have the hole cut out. For a flush model, you’ll find the process very simple. Initially, measuring is the first and most important step. Always measure three times so you ensure you get it right! Make sure that you have enough clearance on all sides of the heater. If you’re hardwiring the heater, you need to find the route of the cables. If the heater plugs straight in then you need to ensure that you have a plug socket nearby. When choosing your wall mounted fireplace, think about the length of the cord. You will need to attach a mounting bracket into the wall. Measure where the holes are on the bracket. Drill holes into your wall using these measurements, exactly where you want the bracket to sit. When secured to the wall, your flush mounted fireplace should slot straight into the brackets. Installing a wall mounted fireplace can really give your home a nostalgic feel throughout the winter months. Negating some of the safety risks of a real fire, you get the same experience, without the hassle. Look for realistic flames, variable heat settings, and the right power capacity for your room. Remember to measure the cord and ensure it is long enough to reach the plug socket nearest the wall on which you want to mount your fireplace.